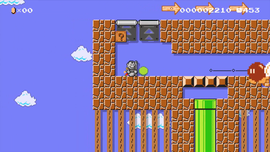 Secrets of Statue Mario is an Event Course in Super Mario Maker, released on March 3, 2016. It unlocks the Statue Mario Mystery Mushroom costume upon completion. The level begins with a single warp pipe. Taking it leads to an area with winged Piranha Plants, along with a ? Block revealing a beanstalk to the next warp pipe. Mario must then follow some lifts upwards, and hit a P Switch and head to the right. He will then be greeted by many Thwomps leading to a Warp Door, and promptly run from a big winged Bob-omb to another warp pipe. Mario must follow a series of Lava Lifts and avoid a stack of Piranha Plants to the next warp pipe. Mario must then hit one last P Switch and run over to the Goal Pole. This page was last edited on July 5, 2017, at 23:49.